Secondary voltage resistance welding leads and power supply applications not exceeding 600 VAC. For welding applications you will need two cables: one connects the machine to the electrode, the other connects the machine to the workpiece being welded, which completes the circuit. Keep in mind that welding cable should only be used in the secondary circuit for welding applications. This is the circuit that supplies power from the machine to the end-use tool (e.g. the electrode for an arc-welder) and not the primary circuit, which supplies power from the electrical outlet to the machine. We recommend always checking with an engineer for applications other than welding. Weld leads are well-known for their durability and flexibility, and as such are often used for power supply applications that require 600V or less and need strong, flexible cables. Welding cable can be used as entertainment or stage lighting cables for movie theatres, lighting and sound systems, and communication vans. 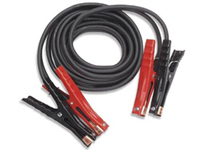 Other possible uses for welding cable include battery cables for cars, inverter cables, and as a cheaper alternative to pendant/reeling cable on hoists and cranes. For example, many solar power installations use welding cable extensively to connect solar panels, battery banks, and inverters. 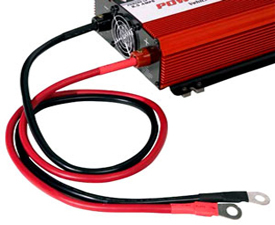 Since DC power is more commonly used for welding, weld leads are widely used as battery interconnectors in cars, solar power installations, and inverters and have been for decades. However, we always recommend checking with an engineer or electrician if you are planning to use welding cable for applications other than welding. NOTE: Welding cable itself works perfectly well for many applications where it would be a code violation if checked. This is because these violations are due to technicalities in the code rather than the usefulness of a cable. Though widely sold and used for solar power equipment, batteries, and inverters, welding cable is not listed as an approved battery interconnector by the National Electric Code (NEC). In fact, using welding cable with anything except a welding machine violates the NEC. It is your responsibility to check the electrical wiring codes that apply to your area. Welding cable is not permitted for use as battery interconnectors in areas where NEC codes are enforced and can lead to problems with electrical inspectors. These are large gauge (thicker) cables generally used as ground or starter cable in automotive engines. Welding cable can be used as battery cable. However, you need to be careful to get the right kind of insulation,(see welding cable insulation for more information). EPDM rubber is commonly used as insulation for welding cable--it is very durable and increases the cable's flexibility--but it tends to soak up oil and grease if not wiped down soon after exposure. Thus, welding cable with EPDM insulation is not recommended for use as battery cable. Even for oil resistant insulation it is a good idea to keep the cable clean of oil and grease, or simply use welding cable in an area where it will not be exposed to any oil. Higher ampacities and much higher strand counts are the two main reasons why some people prefer welding cable over battery cable. Another factor may just be a sense of security knowing that welding cables are designed for use with industrial welders and can withstand being run over by various machinery and hit with specks molten metal. Since solar panels only generate DC power, inverters are needed to convert DC to AC, while battery banks may be used to store excess power. Welding cables can easily handle the voltages and currents produced by solar panels. Welding cables are popular in the solar power industry and used extensively in many solar power installations for connections between solar panels and batteries to inverters. Very flexible, durable, used for applications that are much more hazardous than solar power installations, widely available, and relatively cheap, welding cables are perfect for solar power equipment. Call us at 877.474.8209 to speak with an application engineer about your project.